“I’m not that guy anymore. Once again I couldn’t withhold myself from watching a sequel, although I knew it probably would be a watered down version of the original. And yet I could not resist it. And after re-reading my review of the first movie “John Wick“, I can only conclude that I was right about that. The final sentence I wrote was as follows: “I admire Reeves that he’s still capable to portray a character as Wick at his age of 50 and bring this kind of personage to a higher level, but I’m afraid that this sequel will be a weak carbon copy from the original.” . Unfortunately, I was right. The fake blood department had enough stock this time. The only difference with the first movie is the amount of fake blood they’ve used. Again, John Wick (Keanu Reeves) acts with extreme effrontery and he leaves a pile of bodies behind. The fight scenes, with lots of onrushing guards being killed with a well-aimed head shot, are bloodier than in the previous movie. As for the rest, the structure of the story is the same. This time it’s not stealing Wick’s car and killing his puppy that starts off an unprecedented revenge action. Nope, the retired assassin is required to perform a task commissioned by Santino D’Antonio (Riccardo Scamarcio). A task he can’t refuse because of an old code among assassins. The initial refusal is the cause for a drastic revenge, after which Wick is forced to carry it out anyway. The asked execution has such a negative impact on Wick’s surroundings and gives rise to even more over the top violence and action packed moments. Action,action,action,action and a even more action ! Obviously the emphasis in this second movie is focused on the action segments. Once again, the story itself is pretty thin and the lack of depth when talking about the characters is omnipresent. But ultimately, this lack is just an advantage. This way they could focus completely on the well-choreographed actionscenes that follow each other at a fast pace. I am convinced that the number of eliminations is a lot higher here. It was a prudent attempt to further deepen the story about the assassination syndicate and the neutral area in the shape of the Continental Hotel. Interesting? Yes. Necessary? No not really. You know what the movie “John Wick” stands for and that’s what you want to see. Sheer brutality, violence and a lot of action. And fortunately, they were very succesfull in that respect. Is a retirement justified? Hold on. Chapter 3 is being prepared. I wasn’t particularly impressed by it this time. Even though they moved Wick’s workspace to a more imaginative location and the images from Rome are more eye-catching than those of New York, I got the impression that this movie simply exploited the success of the first part shamelessly. Even Keanu Reeves didn’t have to do his utter best. Granted. The man is very suitable for this role. 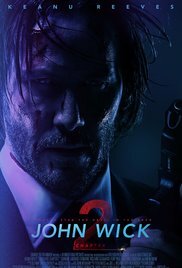 John Wick’s cool-blooded, stoic gaze and the limited use of dialogues are characteristics which are tailor-made for Keanu Reeves. “John Wick: Chapter 2” is a logical sequel to the unexpected success of the first movie. If you are a lover of the better action-movie, this is definitely is something to watch. Now you’ll also see how the myth John Wick can kill someone with a pencil. Personally, I think it’s time Wick starts to think about his retirement!